How Would You Like To Have X-Ray Vision Into The Inner Workings Of Your Business? 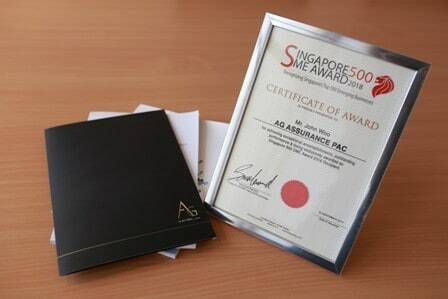 AG Assurance PAC is a mid-tier audit firm in Singapore, serving the niche between the Big Four international audit firms and the smaller local ones. By engaging the award-winning help of AG for an expert advisory audit, it is entirely possible to gain a whole new understanding of your business and finances. You will be able to see your own financial records with the benefit of clarity and unbiased analysis, expose possible fraud, and truly come face-to-face with the heart and soul of your business. Why Choose Our Audit Firm In Singapore? Besides audit services, AG provides comprehensive corporate advisory services. Having all services done at AG enables reducing process, time and cost. AG focuses on service quality. We have a high customer satisfaction KPI of 96.5% which is proven by low lost customer rate. With more than 10-year experience in accounting and audit services, we are equipped with the relevant experience and expertise to provide top notch audit services to you. All audit engagements will be assigned senior or managerial auditors. So, you do not need to worry about having to deal with junior auditors who may be inexperienced. AG has a strict quality control policy that requires our teams to reply your enquiry in 24-hour. If you have any special audit deadline, we will meet it. We communicate, meet up and discuss to understand your business. We customise our audit checklist based on your business as we do not believe one-for-all solution. We emphasize meeting your audit deadline. We analyse your business, find out weaknesses and suggest solutions. for knowing more about your business model. so that you are well-prepared for satisfying audit requirements in advance. We pride ourself in meeting your audit deadlines 50% faster than the industry-standard. In general, we can finalize your audits in 2-4 weeks, compared to the usual 4-8 weeks. Reduce cost, process & time. Audit time schedule will also be constantly reviewed and approved by audit partners. To ensure that your audits are finalized promptly before your deadlines. Every audit firm in Singapore is required to conduct audit in accordance with Singapore Standards of Auditing to ensure audit service quality. Singapore Financial Reporting Standards (SFRS) are adopted as the accounting standards in Singapore. SFRS are similar but not identical to International Financial Reporting Standards (IFRS) issued by the International Accounting Standards Board after taking into accounts the Singapore economic and business context and circumstances. For audit assignments with tight deadline, AG will perform interim audit, normally 2-3 months before financial year end. This is to minimise work and time in concluding the final audit after the financial year. To facilitate smooth audit process, an audit requirements checklist will be tailor-made according to the client’s business model. We will run through the checklist with clients so that they can prepare themselves for satisfying audit requirements in advance. AG employs risk-based audit methodology suggested by Singapore Standards of Auditing. In the audit planning stage, we will perform data crunching to identify key risky areas. So audit testing will be performed to mitigate the audit risk. This enables us to focus our audit on risky areas and significantly reduces time, process and cost. All audit engagements will be assigned at least a senior auditor and supervised by audit managers to monitor audit progress and quality. Audit partners will robustly review and approve audit time schedule to ensure our prompt service delivery. Client A is a subsidiary (“ABC”) of a foreign-listed company, with approximate US$30mil in revenue per annum. Holding company requires ABC to submit its auditor report by end of February every year. However, the auditor of ABC failed to meet the deadline and finalised the audit around end of March. This seriously delayed the group reporting process and dividend repatriation by ABC to its holding company. AG performed interim audit and prepared an audit checklist to better cooperate and communicate with Client A’s accounting team. We managed to finalise our audit in early February, 3 weeks before deadline. Client B (“BCD”) is a construction company with project revenue of more than S$10mil. Audit of BCD was qualified every year by its previous auditor due to improper project budgeting and cost allocation. AG helped to revamp its business model by creating a cost centre, where BCD will outsource all projects to it. Client B’s tax payable has reduced and its auditor report has improved from qualified opinion to clean report. How long does an audit take to complete? It depends on the complexity and volume of your business. Normally, our KPI is to complete audit within 1 month. What are the audit exemption criteria? 3) number of employees is not more than 50. (b) the group must be small group. A group qualifies as a small group if it meets 2 out of 3 quantitative criteria above on a consolidated basis. If my company is dormant but is part of a group which does not qualifies as small group, is it still subject to audit? If the company is dormant, it is exempted from audit. Can my company prepare its financial statements based on IFRS? SFRS is similar to IFRS. Preparing financial statements based on IFRS is acceptable in Singapore. What is the implication if my company changes its reporting period from 12 months to 18 months? There is no implication from audit perspective, except for that prior year figures will become not comparable. From tax perspective, the corporate tax will be computed based on 2 Years of Assessment.